The weekend's talking-point must be the return of Doctor Who (see feature, page 42), with David Tennant getting his first full run after taking the sonic screwdriver from Christopher Eccleston at the end of the last series. It's good that he has found some light relief after his iconic performance as my dad in The Chatterley Affair. Tennant makes an A1 Doctor. (Is that a medical qualification or a PhD? And where did he get it?) After William Hartnell, the Doctors were mischievously eccentric. Much though I admire Christopher Eccleston as an actor, with those sunken eyes and fighting cheek-bones he always seemed too broodingly angst-ridden and suffused with repressed socialist rage. You half expected him to stun the evil alien invaders with an indignant tirade about showing solidarity with the strikers at Grunwick. Eccleston did wacky. but it always felt like a bit of an effort, like a lugubrious vicar being jolly at the Sunday school party. The Doctorly twinkle comes much more naturally to the younger, more elfin, Tennant. This has another advantage for Russell T. Davies and the team, who can now play up the "URST" (Unresolved Sexual Tension) with Billie Piper without it seeming pery. Tennant (34) is only 11 years older than Piper (23), whereas at 42 Eccleston is two years older than Chris Evans. Yuk. Davies has taken full advantage, using a nifty plot desire to engineer a spontaneous snogette, so it's not so much URST as ARST (Accidentally Revealed Sexual Tension). Anyway, there's enough lip-on-lip action to keep Tennant's female fans happy. Which brings me to the reappearance of Cassandra, the face in skin stretched across a rectangular frame like a human trampoline. She appeared in last year's episode about the end of the world and needed constant moisturising with a fine spray. The face of Boe, a huge head in a glass cylinder, also reappears. Have the accountants been demanding multiple use of props? But it's the dependency of these "highly evolved" aliens that is so puzzling. In early series of Star Trek the crew of the Enterprise would encounter beings of unimaginably advanced intelligence. True, most of them could be overcome with a punch on the chin, but at least they were meant to be dangerous. In Doctor Who the evil extraterrestrials seem to evolve into complete wusses who can't survive without weird life-support contraptions. As a naive ten-year-old who had never seen Alien Shreds Godzilla, or whatever, I did find the Daleks a tad scary. But apart from the obvious staircase problem, now thankfully resolved, they looked as if anyone who snuck up behind them could simply shove them over, leasing the malignant bug thing inside helpless. If they had ever invaded Britain's cities, upending Daleks would probably have supplanted "twocking" as the ASBO-holder's recreation of choice. If they were so highly evolved, why were they wandering around in nodule--encrusted dustbins armed with a sink-plunger and a cattle-prod shaped thing like the inside of one of those rollers for defluffing clothes? As for the Cybermen - who return later this series - they looked about as dangerous as the Tin Man but considerably less like potential paedophiles with special educational needs. So it's good that Russell and the gang have remained true to the Doctor Who spirit with ever more useless, unscary or downright ridiculous monsters. I hope it won't spoil anyone's Saturday tea-time fun if I reveal that the first episode includes cats that have evolved into human-shaped nurses and a mob of zombie-like human laboratory-rats with really bad acne. Get behind that sofa now! APA 6th ed. : Hoggart, Paul (2006-04-15). Torrid times in the Tardis. The Times p. 6. MLA 7th ed. : Hoggart, Paul. "Torrid times in the Tardis." The Times [add city] 2006-04-15, 6. Print. Turabian: Hoggart, Paul. "Torrid times in the Tardis." 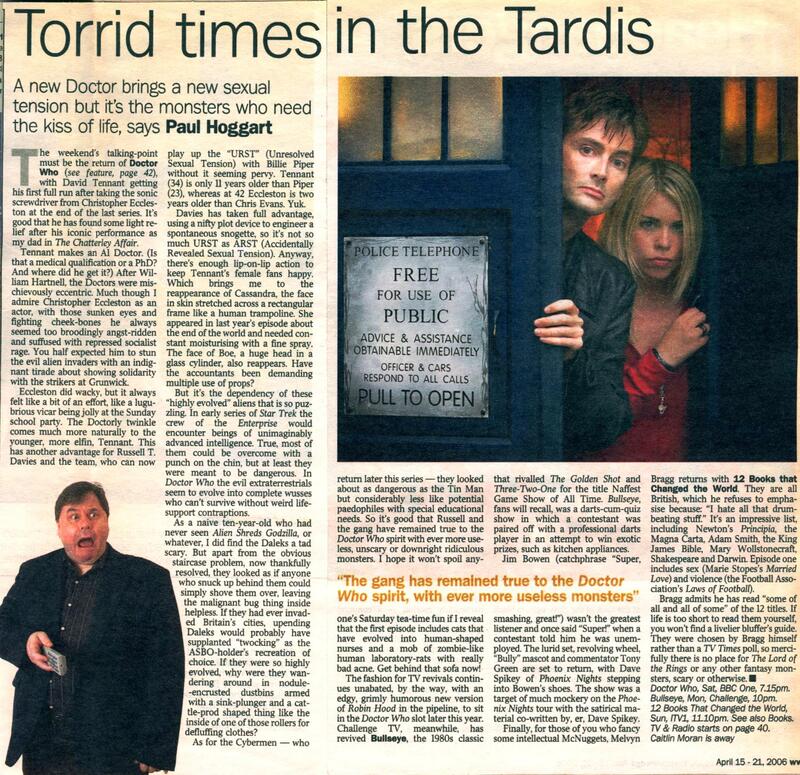 The Times, 2006-04-15, section, 6 edition. This page was last modified on 24 December 2015, at 16:02.